How is Parmigiano Reggiano made? Every day the milk of the evening milking is left to stand in wide basins until the next morning, where the fat part, which spontaneously emerges, is destined to the production of butter. Skimmed milk of the evening is then combined with whole milk of the milking of the morning and it is poured in hot water heaters of copper, where then rennet and grafted serum are combined. In a few minutes milk coagulates giving rise to the curd, which than is fragmented in little grains using a tool, known as “spino”. The whole thing is then cooked at approximately 55 degrees, building a mass that will next be extracted by the cheese-maker. 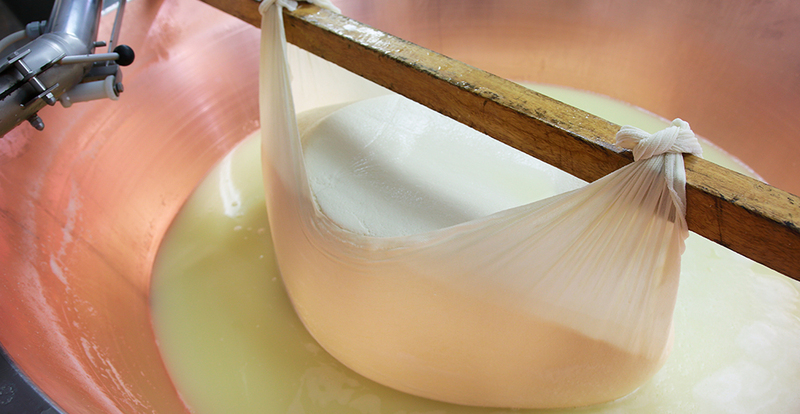 Cheese is then covered in a canvas and placed in a “fascera” that will give to the cheese its definitive form. Using a branded “fascera”, every form will be marked by an identified univocal number, from the month to year of production, from the enrolment that distinctively marks the cheese factory to the writings PDO, from the Consortium of the Protection to the unmistakable writing “Parmigiano Reggiano” with small spots on the circumference of the forms. The casein’s plate is specifically applied on the form’s surface and it reports the writing CFPR (Consorzio Formaggio Parmigiano Reggiano - Consortium of Parmigiano Reggiano cheese) that means the alphanumeric identified code of every single form and the brand Datamatrix for the optical recognition. Forms are placed in long lines on wooden surfaces that will help to dry the external part of cheese, creating a natural crust without treatments. The slightest maturing is 12 months: after that this period of time is spent, you can establish if the form respects all essential requirements in order to keep the name that was printed. If the form should be considered not qualified, it will lose all its starting markings. At this point you can continue the maturing or you can consume a young product, but in any case rich in savour and quality. On this curd young cheese are engraved parallel grooves which make it immediately recognizable for the consumers. If you carry on, according to the months of maturing, forms will receive a sticker with a lobster, silver or gold colour. The sticker with lobster colour states Parmigiano Reggiano with over 18 months of maturing, while silver colour individualizes Parmesan with over 24 months of maturing and gold states the product with over 30 months of maturing. After a careful verification, which is made by the authority control, a brand is applied on the forms that have the requirements of Denomination of Protected Origin.